(January 5, 2012) Dauntless geologist and explorer Yang Yong sits down with Three Gorges Probe to discuss the appeal and risks of dam construction underway in a remote, quake-prone region of Tibet, the suspension of Myanmar’s multibillion-dollar Myitsone dam, and the ongoing challenges facing China’s massive South-North Water Diversion Project. Yang Yong is a well-known Chinese geologist and explorer – and, as his business card says, an independent scientist. On November 6, 2011, Mu Lan, the editor of the Chinese-language Three Gorges Probe, interviewed Yang at his home in downtown Chengdu. Mu Lan: I have been to China several times in recent years, but never had a chance to meet you because you are always traveling here and there – so, in fact, this is the first time we have met. Let’s start by discussing an interview with you in China Dialogue: it appears to me, from that interview, that you are in favor of building hydro dams on the Yarlung Zangbo river in Tibet, in the belief that dam-building would have little impact on the countries downstream, especially in terms of altering the water flow. 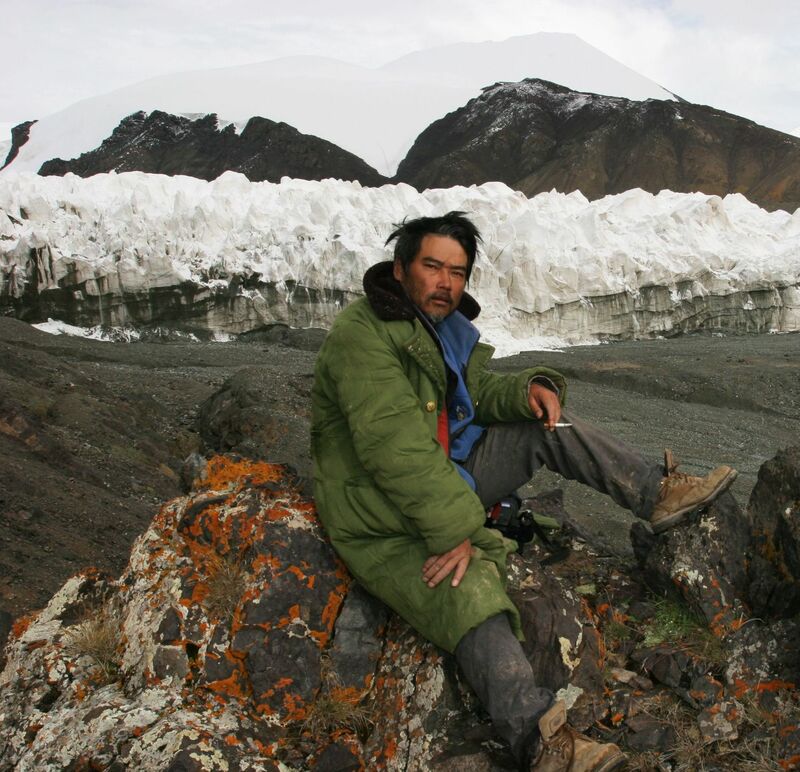 Yang Yong is an independent geologist who studies mountainous areas in western China, venturing to locales other researchers either have not or dare not. Yang is shown here on the Qinghai-Tibet plateau, also known as "the Roof of the World". Yang Yong: I talked about the issue in a lot of detail in the China Dialogue interview. Construction on the Zangmu, the first hydro dam on the Yarlung Zangbo, has already officially started. This caused concerns about water flow in downstream countries, especially India. But I think there is no need to worry about it because the water flow of the Yarlung Zangbo at the Zangmu dam counts for only 30% of the total discharge of the river. According to the government’s plan, nine more dams will be built below the Zangmu dam, taking advantage of a 2000-metre drop in elevation. A 20 km long tunnel will be built so that the water can be channeled to the nine power stations which will be on a tributary of the Yarlung Zangbo. Actually, the plan will not impact the water flow downstream very much, because the water flow of the Yarlung Zangbo at the point where the water will be channeled by the tunnel (at a 400-kilometre-long stretch known as the “Great Bend”) counts for only 50% of the total discharge of the river which eventually flows into India. It is common sense that water backed up by a hydro dam will eventually go through the turbines and be returned to the river’s flow. So, for this reason, we don’t have to worry about a reduction of the water flow. This was why I said that dam building in this area would have little impact on the water flow downstream. ML: So you believe that building hydro dams on the Yarlung Zangbo is a great plan? YY: From the point of view of hydroelectric generation, this plan is very attractive indeed. This river section has the largest hydroelectric generation potential of anywhere in the world. But, to tell you the truth, I am really concerned about two things: one is the geological risks, and the other is biodiversity. On the Yarlung Zangbo in general, and the 400-kilometre-long “great bend” section of the river, in particular, geological conditions are really complicated. My biggest worry is that dam-building is likely to cause geological hazards, especially seismic activity. And with its high mountains and deep gorges, the Yarlung Zangbo valley has rich and unique biodiversity but the environment is extremely fragile. I believe that more scientific and comprehensive studies (of the impact of dam building on biodiversity) are needed. Dams in general, and the construction activity in particular, will surely bring destruction to this biodiversity. ML: On another river, not far from the Yarlung Zangbo, the Myitsone dam which is being built by a Chinese power company in Myanmar has been suspended. What’s your opinion about that? YY: This June, Dr. Yu Xiaogang and myself, as representatives of Chinese NGOs, traveled to Myanmar with representatives from the Chinese Ministry of Commerce, intending to do an investigation and study of Chinese enterprise investments there, including hydropower projects. But, unfortunately, military conflict at the time prevented us from reaching our destination. Our inspection team travelled to Yangon, Mandalay, Rakhine and other places, meeting with local NGOs, representatives of communities, ethnic minorities, industry associations, the media, as well as Chinese companies’ workers. We also examined projects funded by Chinese companies that were under construction. But we cancelled a planned trip to the Myitsone hydropower dam because of armed conflict in the Kachin area. Our investigation focused mainly on the impact of hydropower and oil and gas investments by Chinese companies in Myanmar, and especially on the impact of those projects on local communities. We listen to all parties who voiced their views on the projects and had intensive exchanges with all the parties there. Our team concluded that given all of the investments in Myanmar, Chinese companies should pay attention to the core interests of local people, attach importance to the environmental and social impact assessment, and conduct conflict risk assessment so as to properly handle the relationship between the government and people in Myanmar. Our team also called for exchanges and cooperation between Chinese and Burmese NGOs, in an effort to promote the sustainable development of both the host country and China’s overseas enterprises. Our inspection team also believed that for Chinese companies to achieve their goals, in addition to careful planning and scientific assessment of their investments, they should fulfill their social responsibilities, establish a good reputation by developing a good understanding of the political and socioeconomic conditions in Myanmar, and deal wisely with a changing international environment. ML: Let’s go back to the South-North Water Diversion project, which you have monitored for so many years. Before we talk about the west route, which you have traveled, investigated and studied for decades, can you give me a bigger picture of the two other routes, the east and central ones? YY: The biggest challenge facing the east leg is water pollution. According to reports, at least 60 billion yuan (US$ 10 billion) is needed to deal with water pollution. And hundreds of billions of yuan will be needed to complete the east leg, including restructuring industry to eliminate pollution and manage the Huai River valley environment. As we all know, billions of yuan have been spent trying to solve the water pollution problem in the Huai valley, but with little effect. So I doubt whether the problem of polluted water in the east route can be solved. Meanwhile, local governments along the canal can’t afford to match the budget provided by the central government[i]; water pricing has become a thorny issue in the areas that will receive the southern water; and compensation for ecological damage in the Danjiangkou reservoir area, and the region along the canal, is not really going well, and so on and so forth. ML: We have not heard about the west route for some time, what’s going on with that leg? YY: This is a big topic, so let me put it in a very simple way: based on our intensive study, we have discovered at least seven issues facing the west route. First, geological conditions in this area are unstable, with frequent geological disasters[ii]; second, temperatures drop below freezing for six months of the year making it difficult to keep the water flowing during this period; third, more than 1,000 km of tunnels, traversing as many as five watersheds, will have to be built in order to divert the water, making construction technically very challenging; fourth, the region from which the water is to be diverted is one of the areas most affected by climate change – where glaciers and river systems are retreating, and other environmental deterioration is occurring – which may lead to the sharp drop in water flow, making it difficult to transfer sufficient amounts of water; five, the water diversion would impede full capacity operation of a number of hydro projects downstream; six, large areas of land and pasture, as well as villages and temples, would be inundated with the construction of high dams and big reservoirs in the Qinghai-Tibet Plateau; and seven, the issue of compensation and environmental rehabilitation for the area from where the water will be diverted remains unresolved. ML: So what stage is the project at now? YY: As far as we know, the original plan to start the project in 2010 has been halted while the feasiblity of the project is revisited. As you said, we independent researchers have been studying this project for years, and published a number of books, reports and articles on different aspects of the western route and now we are working on an overall report about the western route. Apart from that, we are also planning to publish a two volume book entitled Western Rivers Report, with one volume focusing on rivers in west China that flow to the sea, and another focusing on inland rivers in west China. At the moment, every power company and every power station in the upper Yangtze is trying to hold as much water as possible to generate as much electricity as possible. If the current situation of gezi weizheng (meaning “each administers its affairs regardless of the overall interest”) and poor coordination among the power stations continues, and severe droughts occur, we are likely to see water supply problems downstream and the drying-up of the Yangtze River. ML: We recently posted a long report in English by Fan Xiao, who has warned that the Yangtze River is going to dry up because of the construction of so many hydro dams on the upper reaches of the Yangtze. What do you think of his opinion? YY: The water supply of the Yangtze will be affected, especially in the dry season, once all the giant dams are completed in the upper Yangtze and if they try to fill their reservoirs simultaneously. ML: One more question: do you have any news about the Nu River? I’m wondering if construction has begun on any dams on the Nu River. YY: People are focusing too much on the Nu River valley in Yunnan while few are aware that dams are already under construction on the Nu River upstream of Yunnan. For example, on the Nu River in Tibet, one dam project has been completed in Biru County, and another, called the Nujianggou hydro station, is under construction in Basu County. ML: Before we finish our conversation, can I ask you a personal question? You have traveled a lot, investigated a lot and dedicated yourself to the study of China’s rivers; do you have a goal, or something you’re trying to accomplish? YY: For more than 20 years in my life, I have walked and rafted so many rivers. I can tell you that for each of my river journeys I have made discoveries. I believe there is disharmony between people and rivers, so my goal is to find a way to get mankind and the rivers to live in harmony, and to find solutions, no matter how difficult the pursuit. In China, the natural complexity of river systems, and the many ways they have benefited people, has been overlooked because, for decades, the approach to development was technical and the measures of economic success narrow. Now we need to understand the interaction of humans and the science of rivers, and not just view the management of rivers as technical exercises. [i] For example, for component projects such as sub-canals and for the resettlement of people. Return to text. [ii] Such as landslides and earthquakes. Return to text.